Hezbollah Secretary General Sayyed Hasan Nasrallah assured Saturday that there are between 35 and 40 resistance axes around the world and their common trait is sympathy with the oppressed people and readiness to sacrifice for their sake. In a speech he delivered during a ceremony commemorating the “martyred leaders”, Sayyed Nasrallah pointed out that Sheikh Ragheb Harb refused to shake hands with the Israeli insisting that the occupation will soon end at a time when everyone considered that the occupation has become an imposed fact that they have to live with. As he denied claims about having any brigades in Venezuela or Latin America, he expressed solidarity with Venezuela against the US aggression and reassured that Hezbollah did not have any brigade outside Lebanon and has previously asked his foreign supporters to work separate from Hezbollah so that they wouldn’t be harmed from this relation. Sayyed Nasrallah reiterated that Israel is aware of Hezbollah’s power and this enough deters it from any attack, indicating that the Israeli entity is aware, according to its own officials, that the Israeli army, specifically its ground force, is incapable of engaging in a war now. “They don’t trust their army, but we trust our resistance. They are certain that the resistance can enter the Galilee but they are uncertain that their army is capable of entering Lebanon, and this is a great transformation. The concern today is in the Israeli settlements not in the south. This is the deterrence equation and it is of great importance,” he said. “Warsaw Summit does not scare us, just like Sharm Sheikh conference did not scare us in the past even though our situation was harder back then. This Summit is weak, and its target is the Palestinian cause which was completely absent while the topic raised was fighting terrorism and keeping stability in the region, knowing that Israel is the head of terrorism in the region. The real propose out of it was normalization and bringing out the secret Gulf ties with Israel to Public. Hezbollah secretary general further noted that the second target of the summit was Iran which is much stronger today to be threatened with any war. 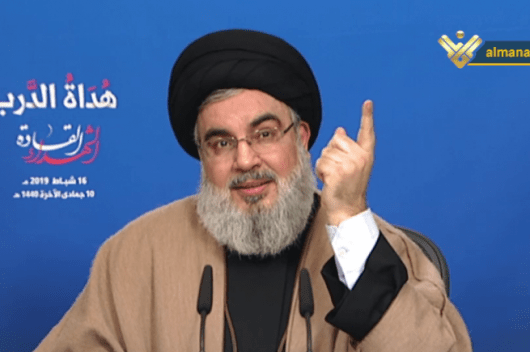 Sayyed Nasrallah reassured that the resistance axis is the one that defeated ISIS in the region not the “US hypocrite who came at the end to play the role of the triumphant”. Internally, Sayyed Nasrallah stressed the importance of dialogue for solving all the issues and files.